WASHINGTON: The US military’s top officer bluntly accused Pakistan on Thursday of “exporting” violent extremism to Afghanistan through proxies and warned of possible US action to protect American troops. In a severe indictment of Pakistan’s links with terror groups, top US military commander Thursday said the ISI provided support to the Haqqani terror network in carrying out the recent attack on the country’s embassy in Kabul. 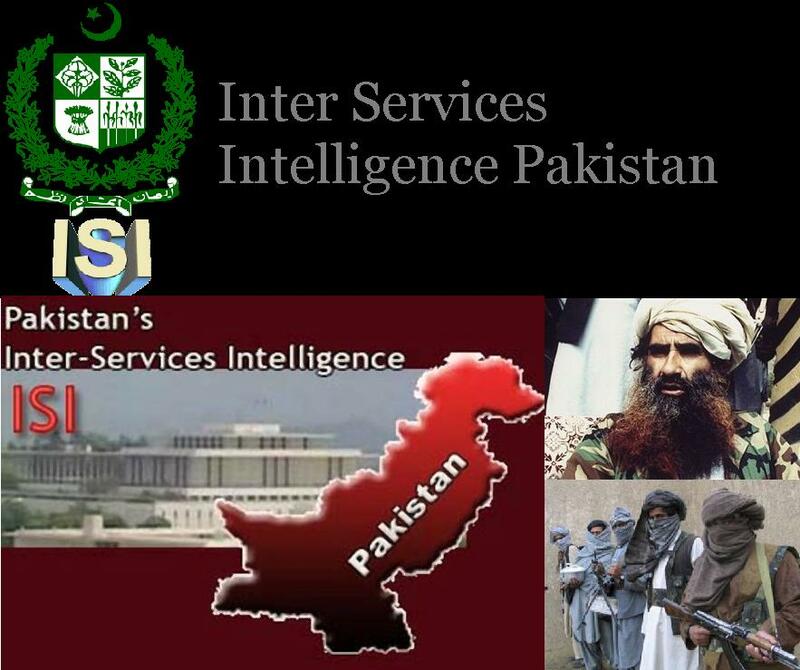 “The Haqqani network, for one, acts as a veritable arm of Pakistan’s Inter-Services Intelligence Agency. With ISI support, Haqqani operatives planned and conducted that truck bomb attack, as well as the assault on our embassy,” Admiral Mike Mullen, Chairman of the Joint Chiefs of Staff, said in his testimony before the Senate Armed Services Committee. “We also have credible intelligence that they were behind the June 28th attack against the Inter-Continental Hotel in Kabul and a host of other smaller but effective operations,” he said. “In choosing to use violent extremism as an instrument of policy, the government of Pakistan — and most especially the Pakistani Army and ISI — jeopardises not only the prospect of our strategic partnership, but also Pakistan’s opportunity to be a respected nation with legitimate regional influence,” Mullen said. He said Pakistan may believe that by using these proxies they are hedging their bets, or redressing what they feel is an imbalance of regional power but in reality, they have already lost that bet. “By exporting violence, they have eroded their internal security and their position in the region. They have undermined their international credibility and threatened their economic well-being. “Only a decision to break with this policy can pave the road to a positive future for Pakistan,” Mullen said. The Admiral added, “As you know, I have expended enormous energy on this relationship. I’ve met with General Kayani more than two dozen times — including a two-and-a-half hour meeting last weekend in Spain. 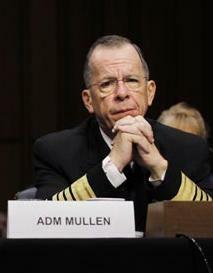 Referring to his meetings with Pakistan Army chief in the past two years, Mullen said some may argue he have wasted his time, that Pakistan is no closer to US than before… and may now have drifted even further away. “I disagree. Military cooperation is warming. Information flow between us and across the border is quickening. Transparency is returning, slowly,” he noted. “With Pakistan’s help we have disrupted al-Qaeda and its senior leadership in the border regions and degraded its ability to plan and conduct terror attacks. 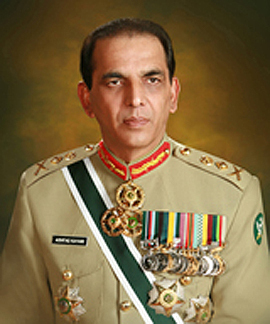 “Indeed, I think we would be in a far tougher situation today, in the wake of the frostiness which fell over us after the bin Laden raid, were it not for the groundwork General Kayani and I had laid — were it not for the fact that we could at least have a conversation about the way ahead, however difficult that conversation might be,” Mullen said. He said what matters most right now is moving forward. “We should help create more stakeholders in Pakistan’s prosperity, help the Pakistani people address their economic, political, and internal security challenges, and promote Indo-Pak cooperation on the basis of true sovereign equality,” Mullen said. US allegations over Haqqani network baseless : Pak Defence Minister. Sparks fly as U.S., Pakistan spar over Afghan bloodshed: No boots on our ground: Pakistan warns U.S. Courtesy : Dawn | DNA | Reuters. 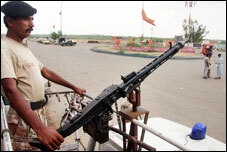 Karachi violence is still intensifying for a big hit and Islamic hatred. 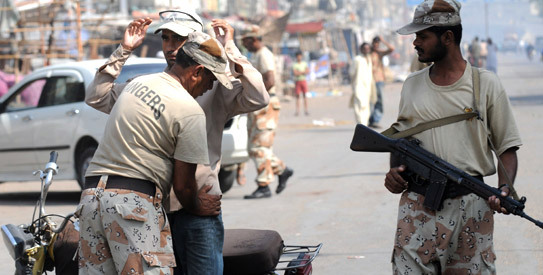 GULF TODAY || Wednesday 15th June 2011, Rajab 12, 1432 || KARACHI: The death toll in a fresh wave of violence blamed on political and ethnic tensions in Pakistan’s biggest city of Karachi rose to at least 20 on Wednesday, an official said. Renewed tensions between the Muttahida Qaumi Movement (MQM) and the Awami National Party (ANP), which represent different ethnic communities, have triggered serious fears that the violence could spill over on a wider scale. “The death toll has risen to 20 with eight more targeted killings overnight in different areas of Karachi,” provincial home ministry spokesman Sharfuddin Memon said. The violence erupted late on Monday. The government in Sindh province said it had stepped up police and paramilitary patrols in the troubled western and central neighbourhoods to avert further killings. Memon gave no specific reason for the renewed violence in Karachi but analysts believe conflicting interests of political forces and poor governance trigger routine flare-ups. “Karachi is a big city where crime and corruption is rampant and targeted killings is convenient cover for criminal mafia to continue their activities,” analyst Imtiaz Gul said. Both MQM and ANP have accused each other of killing their supporters, fanning tensions within Karachi that reverberate to the capital Islamabad, where both factions are also members of the federal governing coalition. In 2010, political violence in Karachi was dominated by flare-ups in August after an MQM lawmaker was shot dead and in October on the eve of the election for his successor. The Human Rights Commission of Pakistan said 748 people – 447 political activists and the rest civilians – were killed in targeted shootings in the city last year. Targeted killings in 2009 claimed 272 lives. SEE : Who are Responsible for Karachi Carnage ?? 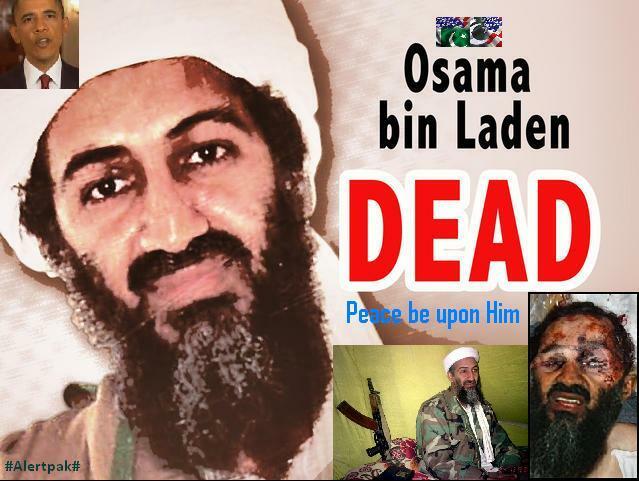 Osama bin Laden breathed last on Pakistan soil. Washington D C || 1st May, 2011 : Good evening. Tonight I can report to the American people and to the world that the United States has conducted an operation that killed Osama bin Laden, the leader of al Qaeda, and a terrorist who is responsible for the murder of thousands of innocent men, women and children. It was nearly 10 years ago that a bright September day was darkened by the worst attack on the American people in our history.The images of 9/11 are seared into our national memory. Hijacked planes cutting through a cloudless September sky, the Twin Towers collapsing to the ground, black smoke billowing up from the Pentagon, the wreckage of Flight 93 in Shanksville, Pennsylvania, where the actions of heroic citizens saved even more heartbreak and destruction. And yet, we know that the worst images are those that were unseen to the world, the empty seat at the dinner table, children who were forced to grow up without their mother or their father, parents who would never know the feeling of their child’s embrace. Nearly 3,000 citizens taken from us, leaving a gaping hole in our hearts. On September 11th, 2001 in our time of grief, the American people came together. We offered our neighbors a hand, and we offered the wounded our blood. We reaffirmed our ties to each other, and our love of community and country. On that day, no matter where we came from, what god we prayed to, or what race or ethnicity we were, we were united as one American family. We were also united in our resolve to protect our nation and to bring those who committed this vicious attack to justice. We quickly learned that the 9/11 attacks were carried out by al Qaeda, an organization headed by Osama bin Laden, which had openly declared war on the United States and was committed to killing innocence in our country and around the globe. And so we went to war against al Qaeda, to protect our citizens, our friends and our allies. Over the last 10 years, thanks to the tireless and heroic work of our military and our counterterrorism professionals, we’ve made great strides in that effort. We’ve disrupted terrorist attacks and strengthened our homeland defense. In Afghanistan, we removed the Taliban government which had given bin Laden and al Qaeda safe haven and support. And around the globe, we’ve worked with our friends and allies to capture or kill scores of al Qaeda terrorists, including several who were a part of the 9/11 plot. Yet, Osama bin Laden avoided capture and escaped across the Afghan border into Pakistan. Meanwhile, al Qaeda continued to operate from along that border and operate through its affiliates across the world. And so shortly after taking office, I directed Leon Panetta, the director of the CIA, to make the killing or capture of bin Laden the top priority of our war against al Qaeda, even as we continued our broader efforts to disrupt, dismantle and defeat his network. Then last August, after years of painstaking work by our intelligence community, I was briefed on a possible lead to bin Laden. It was far from certain, and it took many months to run this thread to ground. I met repeatedly with my national security team as we developed more information about the possibility that we had located bin Laden hiding within a compound deep inside Pakistan. And finally last week, I determined that we had enough intelligence to take action, and authorized an operation to get Osama bin Laden and bring him to justice. Today, at my direction, the United States launched a targeted operation against that compound in Abbottabad, Pakistan. A small team of Americans carried out the operation with extraordinary courage and capability. No Americans were harmed. They took care to avoid civilian casualties. After a firefight, they killed Osama bin Laden and took custody of his body. For over two decades, bin Laden has been al Qaeda’s leader and symbol and has continued to plot attacks against our country and our friends and allies. 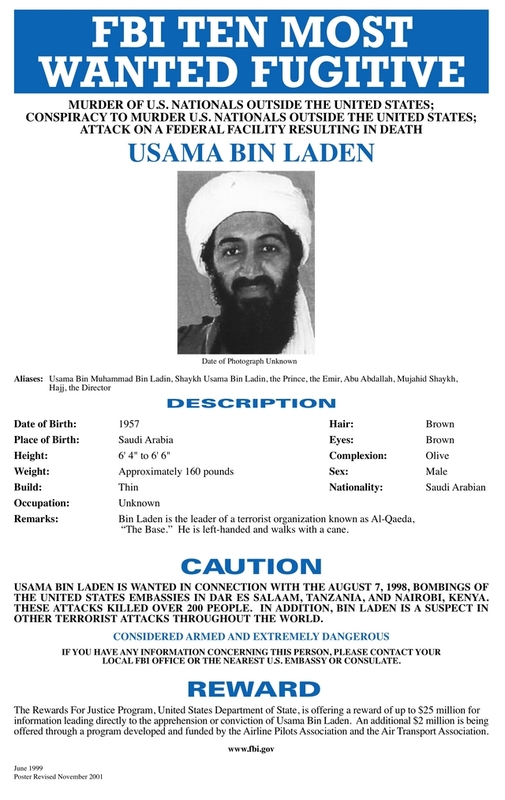 The death of bin Laden marks the most significant achievement to date in our nation’s effort to defeat al Qaeda. Yet his death does not mark the end of our effort. There’s no doubt that al Qaeda will continue to pursue attacks against us. We must and we will remain vigilant at home and abroad. As we do, we must also reaffirm that the United States is not and never will be at war with Islam. I’ve made clear, just as President Bush did shortly after 9/11, that our war is not against Islam, because bin Laden was not a Muslim leader. He was a mass murderer of Muslims. Indeed, al Qaeda has slaughtered scores of Muslims in many countries, including our own. So his demise should be welcomed by all who believe in peace and human dignity. Over the years, I have repeatedly made clear that we would take action within Pakistan if we knew where bin Laden was. That is what we’ve done. But it’s important to note that our counterterrorism cooperation with Pakistan helped lead us to bin Laden and the compound where he was hiding. Indeed, bin Laden had declared war against Pakistan as well and ordered attacks against the Pakistani people. Tonight, I called President Zardari, and my team has also spoken with their Pakistani counterparts. They agree that this is a good and historic day for both of our nations. 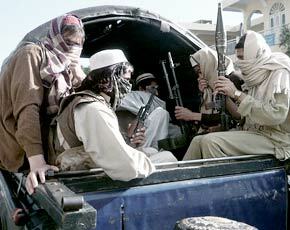 And going forward, it is essential that Pakistan continue to join us in the fight against al Qaeda and its affiliates. The American people did not choose this fight. It came to our shores and started with the senseless slaughter of our citizens. After nearly 10 years of service, struggle and sacrifice, we know well the costs of war. These efforts weigh on me every time I, as commander-in-chief, have to sign a letter to a family that has lost a loved one, or look into the eyes of a service member who’s been gravely wounded. So Americans understand the costs of war. Yet, as a country, we will never tolerate our security being threatened, nor stand idly by when our people have been killed. We will be relentless in defense of our citizens and our friends and allies. We will be true to the values that make us who we are. And on nights like this one, we can say to those families who have lost loved ones to al Qaeda’s terror: Justice has been done. Tonight we give thanks to the countless intelligence and counterterrorism professionals who have worked tirelessly to achieve this outcome. The American people do not see their work or know their names, but tonight they feel the satisfaction of their work and the result of their pursuit of justice. We give thanks for the men who carried out this operation, for they exemplify the professionalism, patriotism and unparalleled courage of those who serve our country. And they’re a part of the generation that has borne the heaviest share of the burden since that September day. Finally, let me say to the families who lost loved ones on 9/11 that we have never forgotten your loss, nor wavered in our commitment to see that we do whatever it takes to prevent another attack on our shores. And tonight, let us think back to the sense of unity that prevailed on 9/11. I know that it has, at times, frayed. Yet today’s achievement is a testament to the greatness of our country and the determination of the American people. The cause of securing our country is not complete, but tonight we are once again reminded that America can do whatever we set our mind to. That is the story of our history, whether it’s the pursuit of prosperity for our people, or the struggle for equality for all our citizens, our commitment to stand up for our values abroad, and our sacrifices to make the world a safer place. Let us remember that we can do these things, not just because of wealth or power, but because of who we are: One nation, under God, indivisible, with liberty and justice for all. Thank you. May God bless you, and may God bless the United States of America. Exactly two years before the 2008 Mumbai attacks, American officials pressured the Pakistan government to crack down on the Lashker-e-Taiba and its front Jamaat-ud-Dawah but were unable to make much headway, according to a secret US diplomatic cable. A cable sent on November 27, 2006 by former US Ambassador to Pakistan Ryan C Crocker, one of the hundreds released by WikiLeaks, said the US embassy had raised the operations of the two groups with “contacts throughout the Government of Pakistan” after the LeT was designated a terrorist organisation under UN Security Council resolution 1267 the previous year. Crocker took up the activities of LeT, Al Akhtar Trust and Al Rashid Trust — all designated underFollowing the Mumbai attacks, the UN Security Council designated the JuD a front for the LeT and imposed restrictions on its assets and efforts to gain access to weapons.1267 — with the then Foreign Secretary Riaz Khan and the then National Security Advisor Tariq Aziz while other US officials engaged the Foreign Ministry’s UN Directorate and the Information Ministry. “No (Government of Pakistan) official, however, has committed to taking direct action to close the operations of these entities,” Crocker wrote in the cable exactly two years before 10 terrorists launched by the LeT carried out attacks in India’s financial hub killing 166 people. Following the Mumbai attacks, the UN Security Council designated the JuD a front for the LeT and imposed restrictions on its assets and efforts to gain access to weapons. The Pakistan government launched a limited crackdown on the JuD and its leaders, including its chief Hafiz Muhammad Saeed. 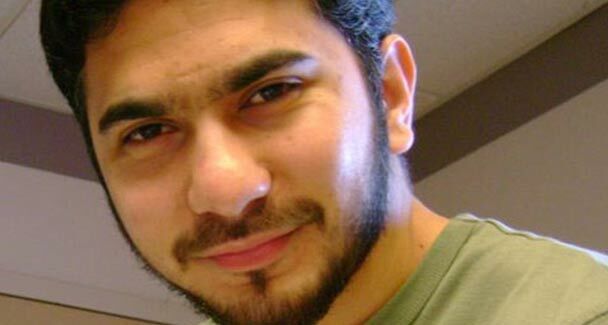 Saeed and several others were placed under house arrest in late 2008 though they were all freed within six months. During his meetings with Pakistani officials, Crocker presented “a press report on the declaration of the Ministry of Defence Parliamentary Secretary that he was proud to be a member of LeT and that he seeks to extend support to jihadi organisations when they seek his ‘cooperation'”, the cable said. Then Foreign Secretary Riaz Khan asked Crocker whether the US had evidence linking JuD to terrorist activity and the envoy “replied affirmatively, noting that the (US Government) has shared such information with (Government of Pakistan) intelligence agencies”. Pakistan-based terror outfit Lashkar-e-Taiba had planned to assassinate Gujarat chief minister Narendra Modi and use Kerala and Tamil Nadu as base for carrying out strikes in southern India, according to a secret US diplomatic cable. Source : Daily Pioneer, New Delhi, India. Pak-based terror outfit LeT had planned to assassinate Gujarat CM Narendra Modi and use Kerala & Tamil Nadu as base for carrying out strikes in southern India, according to a secret US diplomatic cable. Source : PTI || The Times of India. 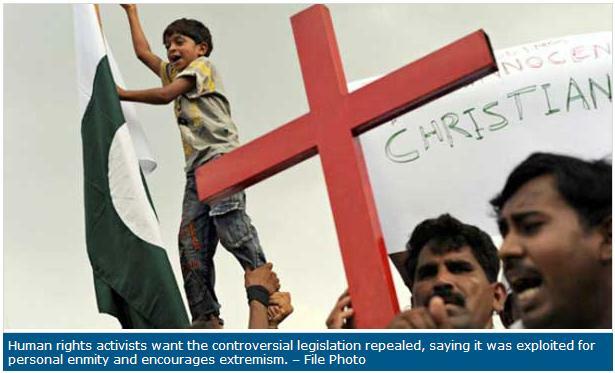 LAHORE: A Christian mother of five has been sentenced to death for blasphemy, the first such conviction of a woman, sparking protests from rights groups on Thursday. 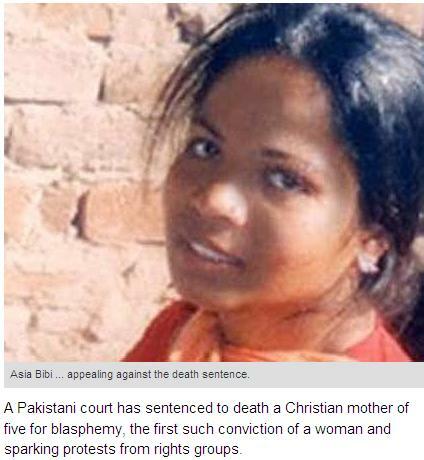 Asia Bibi, 45, was handed down the death sentence by a court in Nankana district in central Punjab on Monday. Pakistan has yet to execute anyone for blasphemy. Ms Asia’s case dates back to June 2009 when she was asked to fetch water while out working in the fields. But a group of Muslim women labourers objected, saying that as a non-Muslim she should not touch the water bowl. A few days later the women went to a local cleric and alleged that Ms Asia made derogatory remarks about the Prophet (peace be upon him). The cleric went to police, who opened an investigation. Ms Asia was arrested in Ittanwalai village and prosecuted under Section 295-C of the PPC, which carries the death penalty. Husband Ashiq Masih, 51, said he would appeal her death sentence. Human rights activists want the controversial legislation repealed, saying it was exploited for personal enmity and encourages extremism. Courtesy : Dawn.com & AFP. Friday 5th November 2010 | Ziqa’ad 27, 1431|| Source : Dawn News, AFP. 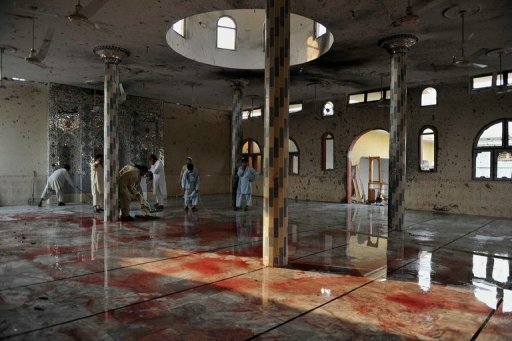 PESHAWAR: A suicide bomb tore through a Pakistani mosque during weekly prayers on Friday, killing 50 people and bringing down the roof, trapping victims under pulverised rubble. The attack in the volatile northwest was the deadliest in two months. Dozens of people were critically wounded and officials feared the toll could rise. 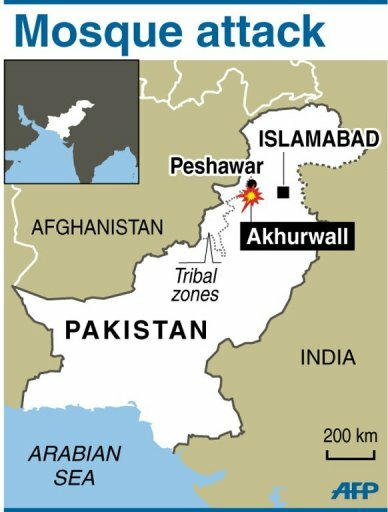 The carnage wrought havoc in Akhurwall village, part of the semi-tribal northwest area of Darra Adam Khel about 140 kilometres west of the Pakistani capital Islamabad. A local official said 11 children were among the dead and television footage showed villagers digging graves within hours of the attack, determined to bury the dead in keeping with Muslim custom before nightfall. Although there was no immediate claim of responsibility, a local elder blamed the Taliban and suggested that the bombers could have been targeting members of a pro-government militia set up to thwart the extremists. “The number of dead is 50 now. There is a possibility it might rise further,” local administration official Gul Jamal Khan told AFP. 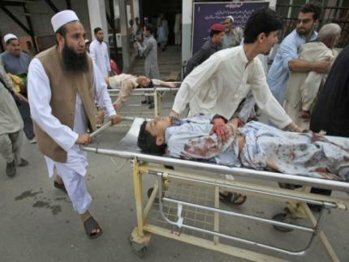 Shahid Ullah, district administration chief of the northwestern garrison town of Kohat, said earlier that more than 40 people had been killed, but warned that the death toll was likely to rise. 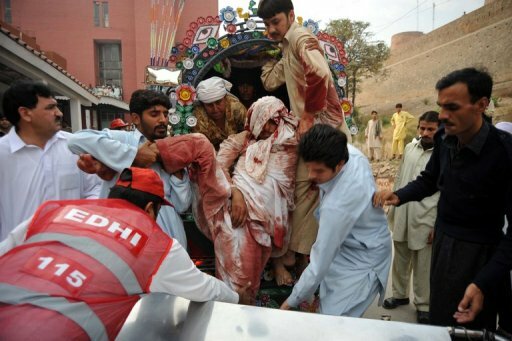 Ambulances and private volunteers rushed to take the victims to hospital in Peshawar, the main city in the northwest. Television footage showed an elderly bearded man wearing a traditional white shalwar khamis drenched in blood limping into casualty while a woman shrieking in grief beat her hands against her head. A private car sped up to the main Lady Reading Hospital with a volunteer sitting next to a body in the boot. 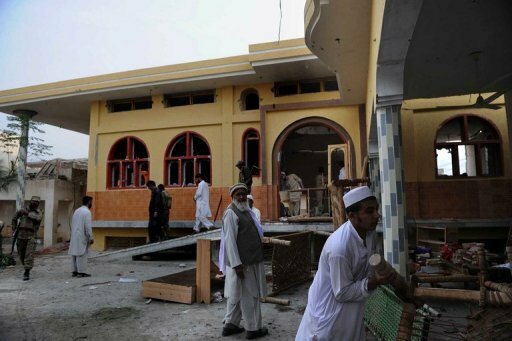 Khalid Umarzai, a regional administrator, said the bomber entered the mosque from the back during the main prayers. Local tribal elder Sohbat Khan Afridi blamed the Taliban, saying Akhurwall is the home of Wali Mohammad, who formed a tribal militia in 2007 to rise up against the militants. The Taliban and the militia, which is known locally as a lashkar, clashed repeatedly in the area but this year reached some kind of compromise in which blood money was paid to the Taliban, Afridi said. “Taliban are believed to be involved in this attack,” he said, declining to go into further details on the alleged deal. Umarzai suggested the attack could have been retaliation for military operations in the Darra Adam Khel area targeting militants. Important reading : Attacking shrines and the culture of peace. Terrorist tanzeem (groups) sponsored madrasas wage proxy war against Indian kaffirs ?? 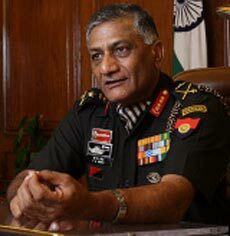 The anti-India terrorist infrastructure in Pakistan is intact and at present 42 terror camps, including new ones in Pak-occupied Kashmir, are being run, Army chief General V K Singh disclosed on Thursday. Now even women are being trained to wage Pakistan’s proxy war against India, he told PTI in an interview. General Singh said infiltration has gone up recently and around 600 terrorists are waiting at “launch pads” in PoK along the Line of Control and the international border to sneak into India. Pakistan has “invested heavily in the proxy war against India” and there has been “no substantial effort” by it to act against terror groups which operate from its soil and are used as a “strategic tool” by that country. “Currently, 42 terrorist training camps are located in Pakistan/PoK. Inputs reveal that some new camps have also been established in PoK for undertaking terrorist training,” he said. The Army chief was responding when asked whether Pakistan has done something to dismantle the anti-India terror infrastructure as has been promised by it repeatedly. “It is assessed that Pakistan will continue to foster terrorism against India and the terrorist infrastructure is likely to remain intact in the foreseeable future,” he said. General Singh revealed that the terror outfits are maintaining a number of officers, stores, transit accommodations and temporary training facilities at various locations in PoK. Talking about infiltration, he said it has recently gone up, with 10 incidents being recorded in June, six in July and 33 in August. Significantly, August witnessed the peak of stone-pelting incidents and other forms of agitation in the Kashmir Valley, which also was being fuelled from across the border. General Singh felt that about 20-25 infiltration attempts had succeeded, which is indicated by the fact that 12 to 15 terrorists were killed in the last 15-20 days. “This shows people have come from somewhere,” he said. On meeting the challenge, he said the Army has a “robust counter-infiltration strategy” which has yielded “excellent results”. He said the Army’s ability to detect and neutralise terrorists attempting to infiltrate or cross over has increased with dynamic troop deployment, proactive use of surveillance and monitoring devices and the anti-infiltration obstacle system. “Inputs also reveal use of terrorist tanzeem (groups) sponsored madrasas for religious indoctrination of new recruits,” Gen Singh said. He said the ceasefire has generally been holding out except for a “few aberrations” and all violations of ceasefire are taken up with Pakistani military authorities at the appropriate level through the established mechanism of hotlines, flag meetings and weekly talks between the Director Generals of Military Operations. On the situation in the Northeast, the Army chief said the multi-pronged strategy adopted by the government and sustained operations by security forces have considerably marginalised the activities of various insurgent groups operating in the region. Courtesy : Indian Express, AP. Islam endorsing terror? Pakistani Ulema and Alem’s Islam is not detached from Terrorism. Ulema and Alem’s Islam not detached from Terrorism. The proceedings at the Deobandi ulema’s recent conference in Lahore must be studied less for its expected refusal to condemn suicide bombings and more for the insight it gives into the psyche of a large section of our powerful ulema community.Of equal significance are the fissures that came to the fore between hardliners and harder-liners. Evidently, the latter carried the day. It was gratifying that at least some ulema — among them Maulana Samiul Haq — were cognisant of the negative impact which acts of terrorism were having not on the nation but on the Deobandi image. 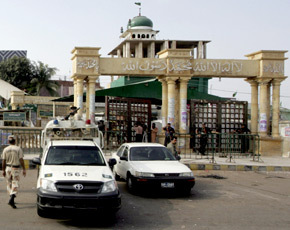 While the delegates did indeed plead with the militants to adopt peaceful and democratic means for the establishment of Sharia in Pakistan, a majority of the ulema, according to Nasir Jamal’s reportage (Dawn, May 2), said terrorism would continue to haunt Pakistan as long as “factors and causes” responsible for it continued. What was mind-boggling, however, was the principle some ulema propounded to establish a link between terrorism and government policies. Briefly, the ulema at the Lahore moot said that the government’s foreign policy was pro-America, and this obedience to commands from Washington in their opinion was the reason behind the militants’ war against the government. That this war against the government and the army translates itself into a war on the state of Pakistan itself was an issue into which the ulema chose not go. If one were to accept resort to terrorism as a justifiable means for registering dissent against government policies, then every country in this world must be ravaged by terrorism, because there is no government on the surface of the earth whose policies do not have critics. Let us, for instance, see the situation in two of Pakistan’s neighbours — Iran and India — where government policies have diehard foes. The nuclear deal between America and India was first agreed upon in principle when Manmohan Singh met George Bush in July 2005. It took more than three years for the treaty to go through the various phases of America’s complex constitutional process and approval from the International Atomic Energy Agency and the nuclear suppliers’ group. The treaty evoked opposition from key members of the Senate and House foreign relations committees, but to my knowledge no senators or congressmen or lobby groups resorted to terrorism or to threats of terrorism to express disapproval of this aspect of the Bush government’s foreign policy. In India the treaty aroused intense opposition, not only from the traditionally anti-American parties of the Left but also from the extreme rightwing Hindu parties, including the Bharatiya Janata Party. The press was equally divided, and influential sections of the print and electronic media came out with highly technical opinions from nuclear scientists who argued that the treaty undermined India’s nuclear programme. The opposition finally called for the Manmohan government to obtain a vote of confidence, and it goes without saying that the vote saw a phenomenon we in Pakistan are quite familiar with — MPs were bought and convicts brought from prison to cast their votes. All along the intensely emotional debate, no party or group started killing India’s own citizens and blowing up markets and schools and temples and mosques because they thought the Manmohan government had sold India to Washington or to its corporate sector. To our west, we have a theocracy in Iran, almost as obscurantist and ruthless as Ziaul Haq’s tyranny. The clerics have imposed an ideological dictatorship on Iran, the Internet is censored, foreign channels are banned or shown selectively, there is no opposition press and even government newspapers are often banned when they deviate from the official line. The economy is in a mess, and crude-producing Iran imports half its oil because of lack of refining capacity. The parliamentary opposition does manage to put its views across, but the real opposition has gone underground. But no opposition group has started killing Iran’s men, women and children and blowing up shopping plazas in Tehran and bombing schools in Isfahan or mosques in Mashhad because President Ahmadinejad is pursuing wrong policies. It is, however, in Pakistan that some sections of the ulema think that killing our own people is a justified way of expressing dissent against the government’s policies. Mind you, the government’s perceived pro-American policies do not have opponents merely in the religious right. Even liberal sections of opinion — the recently formed Workers Party Pakistan, for instance — are sharply critical of a continuation of Pervez Musharraf’s war on terror by the PPP-led government. But none of these political parties and elements has justified blasts in Moon market or the blowing up of mosques or a girls’ university to register their protest against the government’s foreign policy. 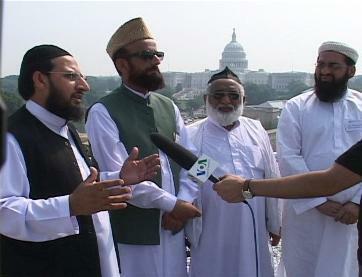 The religious touch to the ulema’s anti-Americanism is laughable. Just the other day, they were head over heels in love with America, and any opposition to the CIA’s overt and covert operations in Afghanistan was considered heresy because there existed an “indissoluble unity” among the People of the Books. The ulema know the hurmat Islam attaches to human life. In case some of them have forgotten, the blast in the Rawalpindi Askari mosque on Dec 4 last killed, among others, 16 children. P.S: For some mysterious reason, ideologically motivated governments, movements and individuals, whether religious or secular — Nazi, Zionist, Taliban — are singularly devoid of the milk of human kindness. The attitude of a large number of Pakistani clerics today reminds us of the Christian church’s cold-bloodedness in burning purported heretics at the stake in medieval Europe. Saved Situation in Times Square :: Pak Taliban Design unearthed. 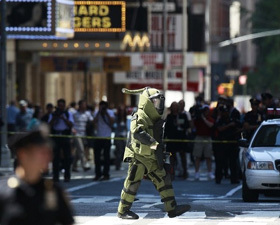 WASHINGTON: US Sunday said it has evidence that the Pakistani Taliban was behind last week’s failed attempt to detonate a car bomb at Times Square in New York and that terror suspect Faisal Shahzad was “working at their direction”, US Attorney General Eric Holder said Sunday. 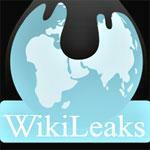 “We know that they helped facilitate it. We know that they probably helped finance it, and that he was working at their direction,” he said. 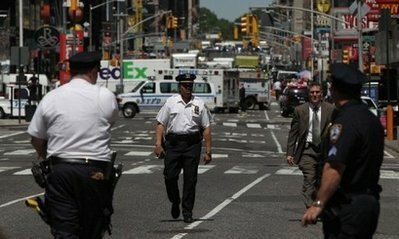 Faisal Shahzad, a Pakistani born US citizen, was pulled off a plane to Dubai and arrested Monday for allegedly leaving a sport utility vehicle rigged to explode in New York’s Times Square just over a week ago. Holder’s comments came as the New York Times reported that the United States warned Pakistan it must crack down on Islamic extremists or face severe consequences. General Stanley McChrystal, the US commander in Afghanistan, urged Pakistan’s General Ashfaq Parvez Kayani in Islamabad on Friday to quickly begin a military offensive against the Pakistani Taliban and Al-Qaeda in North Waziristan. ^^AFP/Getty Images/File – Police in New York’s Times Square on May 7. John Brennan, the White House deputy national security adviser, echoed Holder’s charges, pointing the finger at the Pakistani Taliban in an interview with CNN. 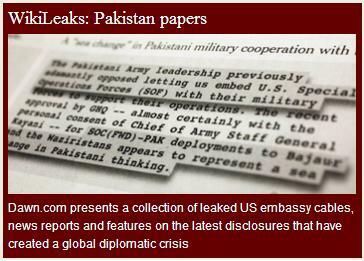 Courtesy : DawnNews, AFP, AP and Agencies. Pakistani Friends of Jihadi Fire. As in Pakistan, terror groups have turned against the state that nurtured them in Egypt, Algeria, and Saudi Arabia. 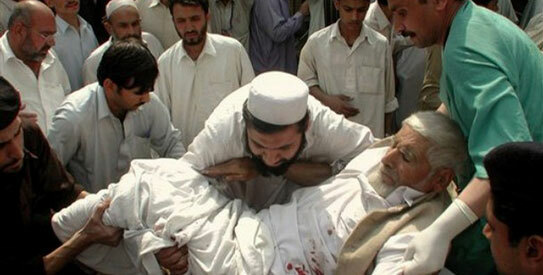 On April 19, a Jamaat-i-Islami (JI) rally in Peshawar was attacked by a suicide bomber. 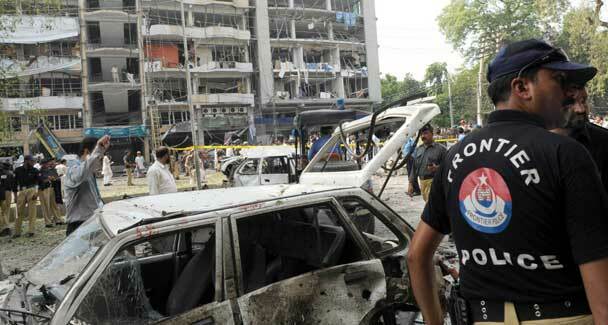 The gruesome attack was allegedly engineered and undertaken by members of the Tehreek-e-Taliban Pakistan (TTP). The irony is that the JI are one of the few mainstream political parties in the country that actually sympathise with the TTP, claiming that the terror group is fighting a war against “American imperialism” and against the Pakistani state’s “aggression” in the north-west of the Khyber-Pakhtunkhwa province. But the irony in this respect wasn’t a one-off. In early April, former ISI sleuth, Khalid Khawaja, was kidnapped along with another ex-ISI man by a group of terrorists labeled (by the media) as the ‘Punjabi Taliban’ (or Punjabi extremists having links and sympathies with the Pushtun Taliban). 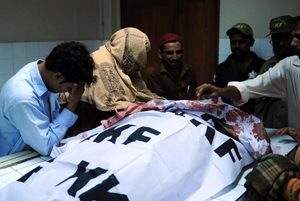 On April 29, Khawaja’s murdered body was found in the turbulent tribal area of North Waziristan. He had been shot twice. A faction of the ‘Punjabi Taliban’ calling itself Asian Tigers claimed responsibility. Khawaja was an open supporter and sympathiser of the TTP, and was known to have had deep links with various Sunni sectarian organisations, and within both the Pushtun and Punjabi Taliban groups. The attack on the JI rally and the murder of Khawaja by these groups have highlighted a bitter truth; a truth that has for long been stated loudly by the current government and various ‘liberal’ media personnel and ‘moderate’ Islamic scholars. They are right to suggest that as far as terror outfits such as the TTP and their sectarian foot soldiers are concerned, a majority of Pakistani Muslims (or for that matter, Muslims around the world) are either ‘false Muslims’ or outright infidels. Read full article in blog.dawn.com here.